Sunday night I was driving home from my sister's house ready to tackle the last of the snow shoveling, when I stopped at a stop light. And what to my wondering eyes did appear, but three reindeer foraging in the snow. The photo does not do justice to how very close I was to them. To see their thick winter coats from that close was a sight, knowing that the night before temps had dropped to nearly 30-below. 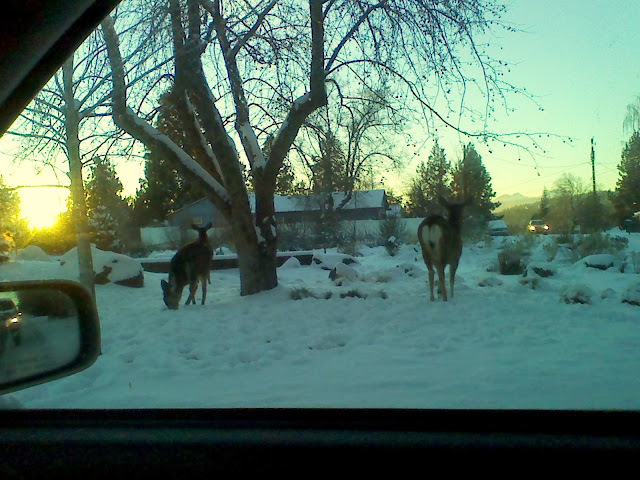 Deer are not an unusual sight in this mountain town. But this moment, with the sun just on the verge of setting, was too perfect not to attempt to capture, even from the driver's seat. And hey, after last week's Sound of Music special, doesn't it make you want to break out in song and frolic through the snow?